Sub-Slab Plumbing System Renewal Without Extensive Excavation, Houston, TXHome and business owners throughout Texas experience the effects of deteriorated and aged plumbing systems located below slab foundations and in walls and ceilings. This home was experiencing foundation upheaval due to leaking sewer pipes located below slab level and low pressure and rusty water due to the deteriorated water pipes located in the walls and ceiling. Accurate Leak and line was able to provide the homeowner with a cost effective solution for complete plumbing system renewal without excessive excavation, trenching or home destruction in order to access and replace the failing pipe system. Parts of the sub-slab system that were unable to be epoxy pipelined were accessed through an exterior access tunnel, and the piping replaced. The long runs of piping below slab were then lined with our impermeable epoxy pipe-liner eliminating approximately 100 ft of excavation and saving the homeowner thousands in excavation costs. The galvanized water piping system was sand blasted clean and then epoxy coated throughout to renew and prevent future leaks.Our epoxy water pipe coating system eliminates the need for excessive destruction to walls and ceilings that are associated with traditional water system re-pipe. Accurate Leak and Line’s team of master plumbers are highly experienced and specialized in epoxy pipelining techniques as well as experts in providing cost effective solutions for traditional excavation and repair or replacement of leaking piping systems. 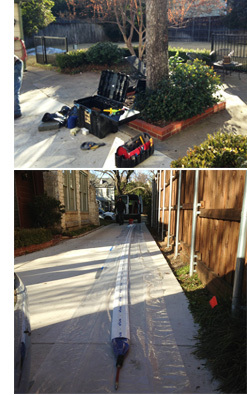 Accurate Leak & Line is a Texas based Company with offices and full time pipelining technicians in Austin, and Dallas. Each of our three office operations are full-time managed by Texas Master Plumbers specializing in epoxy pipe coating and lining of aged and deteriorated pipelines including Galvanized and Copper Potable Water Systems, HVAC , Cast Iron, Concrete and Clay Sanitary Sewer Systems, Roof Drains and Surface Drains etc. We would like the chance to meet with you to discuss our pipelining techniques and how they would greatly benefit your organization. Please view our website to learn more about us and contact our office nearest you to schedule a meeting. Please visit our newsletter archive to view other high-profile jobs completed across the state of Texas.